Responsible parents teach kids how to share toys. When the youngsters grow up and their toy of choice is a Macintosh, with any luck, they’ll still be in that sharing frame of mind. You should see the System Preferences appear. 3Change your computer’s name at this point, if you want to. Calling it Edward C Baig’s MacBook Air makes it sound like you’re saying It’s my computer, and you can’t play with it. Naming it Basement Air, for example, would help you distinguish the computer from, say, Bedroom MacBook Pro. 4Select the various sharing preferences you feel comfortable with. 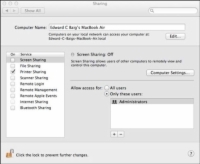 If you select File Sharing, for example, users of other machines can access any Public folders on the Mac. If you change your mind about sharing — you may feel uneasy about having just anyone on the Net read those publicly available files — deselect that check box. Other Mac users can access your machine by choosing Go→Network in Finder. 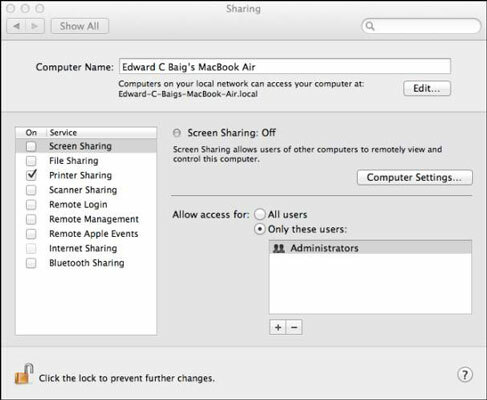 If you’re an iCloud member who plans on taking advantage of the Back to My Mac feature, make sure to select the Screen Sharing check box.